I have a bit of a thing for elephants so when I saw a new paper product made of elephant dung in the Opus newsletter I had to check it out. It turns out there are a few companies making papers out of the undigested cellulose material. Here are three of them. 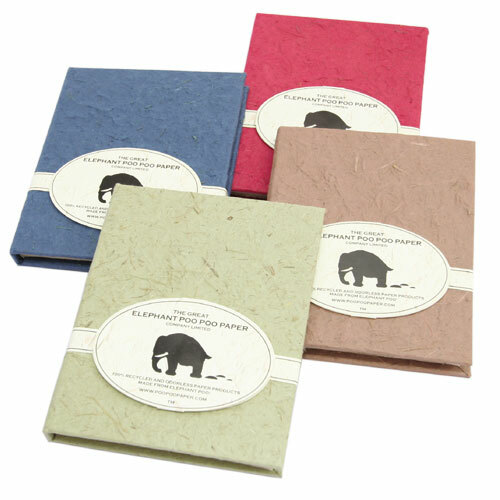 The Great Elephant Poo Paper Company Limited promises environmentally friendly, elephant friendly, sustainable paper products. Made from the fibers that have passed through an elephant’s gut, Elephant Poo Paper is now available at Opus Framing and Art Supplies. The GEPPCL isn’t the only company making paper from animal processed fibers, The Exotic Paper Company makes paper from both rhino and elephant dung. They also appear to have an interest in rhino and elephant conservation efforts. Mr. Ellie Pooh operates out of Sri Lanka where shrinking land resources lead to human/elephant conflicts. The website mentions the long term plan of the company’s founder is to introduce a project designed to create an industry that will lessen the conflicts between people and elephants in the rural areas where elephants are often seen as pests who destroy crops and have no economic value. I have no idea what the paper is actually like as a drawing material, I haven’t tried it yet. Some experimentation may be in order. I hope that you only use free range elephant poo paper. It’s the only morally correct dung-based paper to use!